How do I set up my organization? Organizations (also known as circuit or company) are the "people" that host events. Log in to your CompetitionSuite account. Once in the home screen, open the drop-down box under Overview and click on + Host an Event. 2. Enter your organization's name and initials and click Next. 3. Enter your competition start and end date and click Next. You will be able to create as many seasons as you need once your organization is set up. 4. 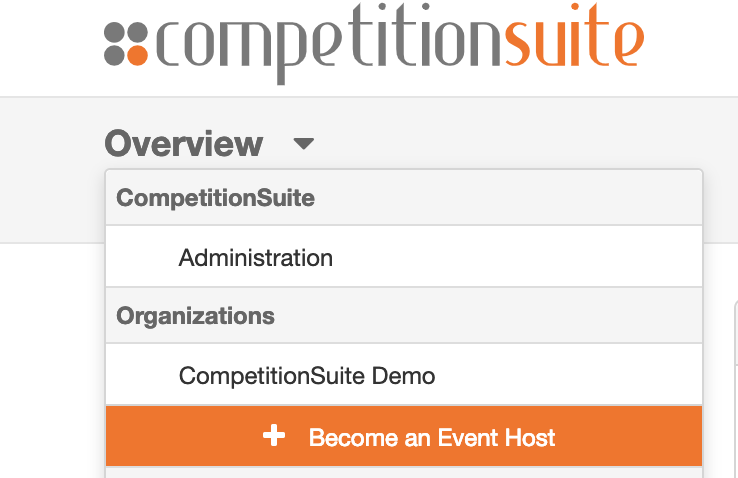 Select the type of competition that best describes what your organization hosts and click Next. 5. 6. Review the information that has been entered and if everything is correct, click Create! Click Back if you need to correct any details. Subcaption: Where scores are assigned. For ease of use, we have compiled some scoring systems under the most popular types of competitions that you can use by clicking on one. If you do not see a scoring system listed, you can customize your own by clicking + Create My Own. Once you have selected your organization's scoring system, click Next. 6. Review the information that has been entered and if everything is correct, click Create!